When today's parents were kids, summer camp probably meant weeks of wilderness immersion with time spent swimming, singing and making lanyards. But for many families, the camp experience has changed. Their kids now attend shorter sessions or commute to day camps closer to home. Camp staffers and experts explain the trend by noting several societal shifts: School years are longer than they used to be; parents are more interested in having their children specialize in an activity, such as playing an instrument or learning a sport; and kids have increased demands on their time during the summer. Helicopter parents, constantly worrying over their offspring, are also a factor. As Jeremy Plane, assistant director of the YMCA-affiliated boys' Camp Abnaki in North Hero, puts it: "Sometimes a kid is really ready for camp, and a parent is not." As a result, sleepaway camps are now competing with an ever-expanding array of day camps, many of which offer varied specializations at attractive prices. Which is right for your child? We weigh the pros and cons of both, even if it's a little like comparing juice boxes to s'mores. It Takes a Wigwam: The consensus among some camp administrators is that sleepaway camps engage kids in community building to a far greater degree than day camps. Living cooperatively with seven or eight strangers, Plane points out, requires skills that can be tough for youngsters to learn. "Those are important things that are part of growing up that kids are not getting in school or in other settings," he says. A strong camp community, notes Camp Abnaki director Jon Kuypers, can engender an ethic of cooperation. "You spend a week at camp, and you realize how important it is that people help each other out," he says. 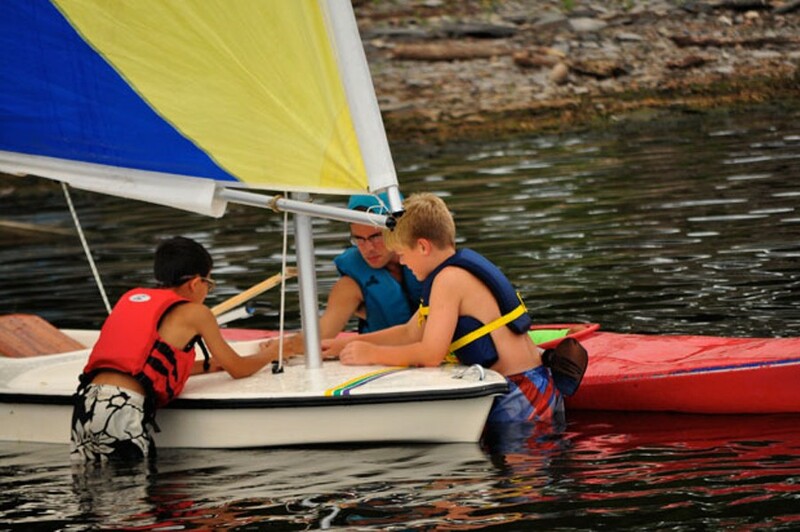 That sensibility is important at Abnaki, he adds, where campers are guided toward specific character values: caring, honesty, respect and responsibility. At Abnaki, these goals are stated explicitly in the camp's motto, "Help the Other Fellow." Anne Sherrerd, a Greenwich, Conn., mom who attended Camp Songadeewin, a girls' camp on Lake Dunmore in Salisbury, has relived that sense of community while watching two of her three daughters become "Songa women." Even in trying circumstances, she says, the girls have learned to support each other. But most circumstances at camp are joyful. One of Sherrerd's daughter's camp friends once managed to throw her a surprise birthday party while on a canoe adventure — complete with a cake cooked over a campfire. Friends for Life: While community and character building are camp goals, lasting friendships are what make former campers get misty-eyed. Ferrisburgh dad Ed O'Hara, an alum of the all-boys Camp Dudley in Westport, N.Y., still keeps in touch with friends from his camp days. And he's seen two of his three daughters forge strong bonds with peers at Camp Kiniya in Colchester, which was purchased by Camp Dudley in 2004. "The youngest one has a close friend from Pennsylvania whom she texts now and then with, 'Meet you at breakfast,'" he says. "They'll do that in the middle of January." Self-Starters: Most parents of sleepaway campers can't help but notice their kids are different when they come back. "She goes away for a month, and her confidence level rises," O'Hara says of his youngest daughter, now 14. "Both girls that have been [to camp] are very self-confident ... They go, and I don't hear things about the peer pressure or trying to be someone that you're not." Burlington mom Mattie Scheidt has noticed similar changes in her kids when they return — her 10-year-old daughter from Camp Killooleet in Hancock and her 11-year-old son from Camp Chewonki in coastal Wicasset, Maine. "I think [camp] is teaching them how to make choices without having to seek other adults and always needing to come to us," she says. "They come back with more self-esteem, and they're learning skills that [my husband and I] might not necessarily be good at or want to be good at." Hitting the Off Switch: Many camps prohibit cellphones and internet use. Ellen Flight, director of Camp Songadeewin and president of the Vermont Camping Association, says these policies "give kids the skills for engaging people-to-people. That's the only option at camp." Mahlon Stewart, a New York City resident who spent some formative summers at Camp Keewaydin Dunmore, Songadeewin's "brother camp," also on Lake Dunmore in Salisbury, credits the very real fresh air of Songadeewin with helping his 13-year-old daughter rediscover her truer nature. "Each year, when we go up to the midseason barbecue, she is relaxed and the happiest I see her all year," he says. "I think there's a certain decompression that happens at camp where she's allowed to be the person she is without the extraordinary pressures of school and city life." More Bank for the Bunk: For all their timeless appeal, sleepaway camp comes at a contemporary cost. Some of the more established camps and their affiliates, such as the Keewaydin and Dudley camps, can run upwards of $1000 per week. Do the math for an eight-week session — ka-ching! YMCA-affiliated camps, such as Camp Abnaki, offer voluntary tiered pricing, which puts the cost at roughly $600 to $800 per week, with discounts for multiple sessions and campers. Appreciating the barrier that cost represents to many families — and the value of a socioeconomically diverse camp community — camp administrators undertake energetic fundraising for scholarships. The YMCA puts its money where its mouth is, Plane says: "One of our mandates is that cost is not an obstacle in being a participant in our program." Pay as You Go: Without the cost of room and board, day camps are naturally less expensive than sleepaway ones. One of the more popular Burlington-area day camps, for example — the Petra Cliffs Summer Mountain Adventure Training Camp — costs roughly $300 per week. Raptor Camp — a weeklong birding program run by Outreach for Earth Stewardship at Shelburne Farms — costs about the same. Town recreation department day camps can be even cheaper. The lighter financial burden can be a blessing, especially to parents stringing together multiple camps over the summer. Fun in Focus: Burlington dad Dan Maxwell and his wife have been enrolling their daughters, now 8 and 11, in a patchwork of day camps since the girls graduated from preschool. The girls like being able to focus on specific skills and interests, with the flexibility to shift to something else a week or so later. Unlike at sleepaway camps, the benefits are more skills based than social, says Maxwell, "giving them something they can do year-round," such as rock climbing at Petra Cliffs. Sailing instruction was another highlight of a weeklong day camp, offering an experience that his girls wouldn't have had otherwise. Burlington mom Betsy Rosenbluth says her daughter, Mari, 11, has been able to choose a variety of day programs in keeping with her interests: art and theater camps, raptor camp, and a Petra Cliffs camp experience that included caving. Testing the Waters: Day camps can also act as "feeder" camps for longer sleepaway sessions. According to Plane, the Abnaki day-camp program serves this purpose to an extent, although the day and sleepaway camps don't mix much. Rosenbluth and her daughter are in the midst of making the transition to sleepaway camp. Rosenbluth attended camp growing up around Cleveland, Ohio, but says she let her daughter decide if and when she was ready to leave home for an extended period. Now that some of Mari's friends are starting to attend sleepaway camp, the 11-year-old has come around to the idea. Her choice: a three-and-a-half-week session at Farm and Wilderness Camp in Plymouth. Rosenbluth is pleased with the choice. "There's something, now that she's in middle school, that's really great about her just being with other middle schoolers and on her own," she says. "That, for me, is really exciting." The Commute and the Calendar: While Maxwell is disinclined to send his girls to sleepaway camp for long stretches, he also acknowledges some limitations to day-camp hopping. For one thing, while day camps are meant to mesh with parents' work schedules, if his daughters are attending day camps in different towns, it's a lot of driving. The fees for late pickups add up quickly, increasing the day-camp expense. Then there's the puzzle of researching and registering for day camps in the wintertime to cover the summer months. With two kids at sleepaway camp, Scheidt no longer has that problem. "The February crunch — I don't miss that at all," she says. Want to discuss the day versus sleepaway decision with camp staff in person?< Representatives from dozens of camps and schools will attend the Kids VT Camp & School Fair on Saturday, February 2, 10 a.m.-2 p.m., at the Burlington Hilton.